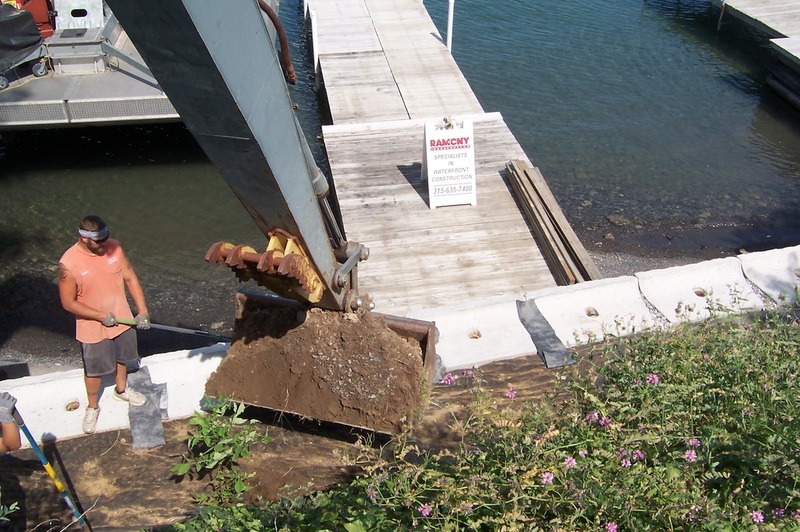 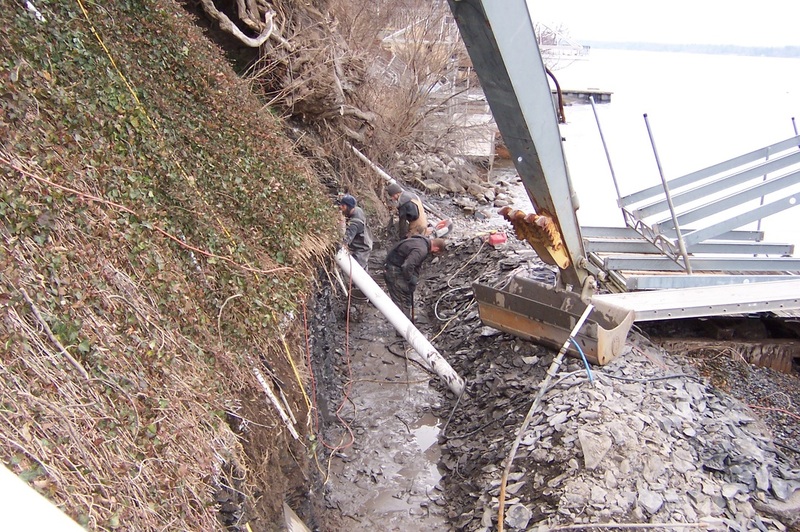 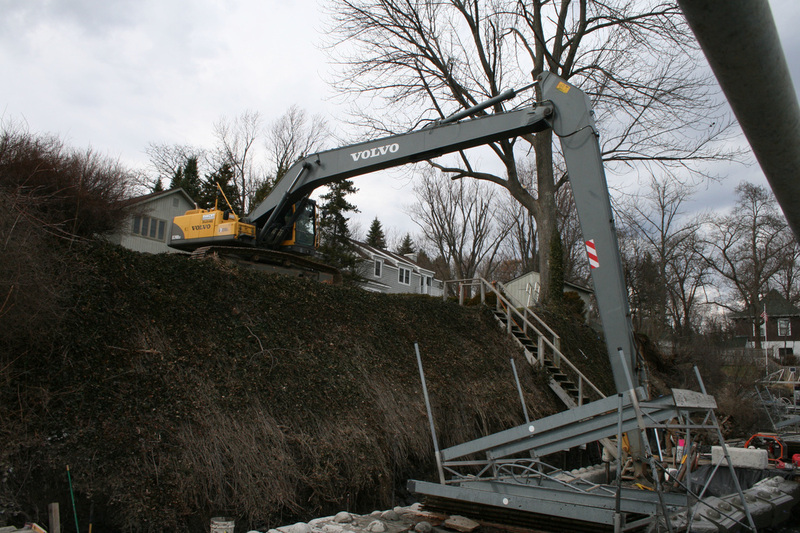 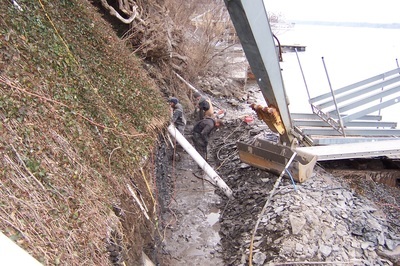 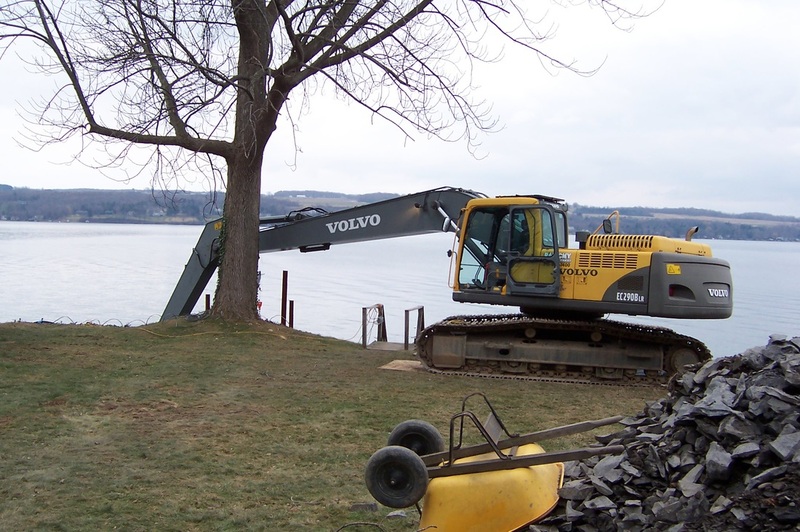 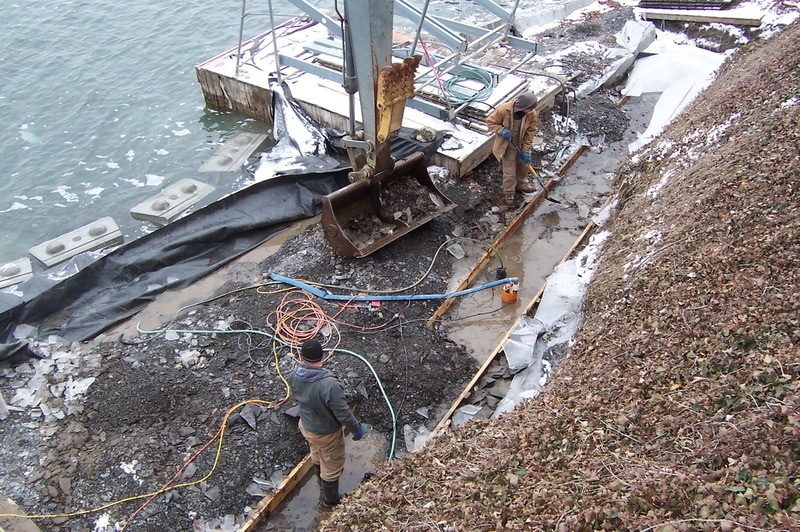 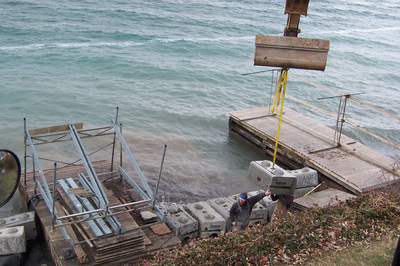 We are currently working on Skaneateles Lake. 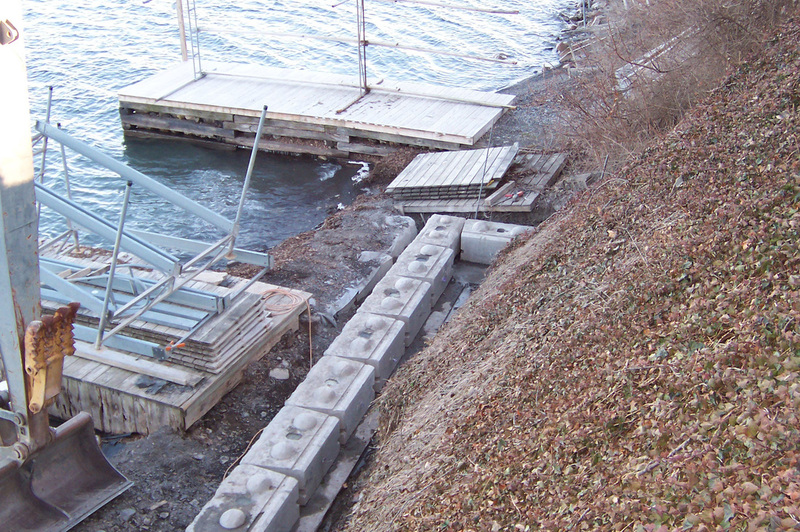 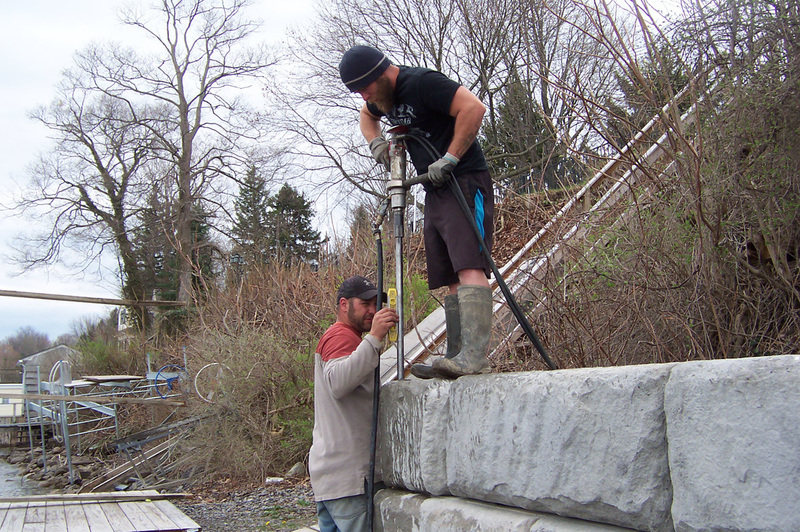 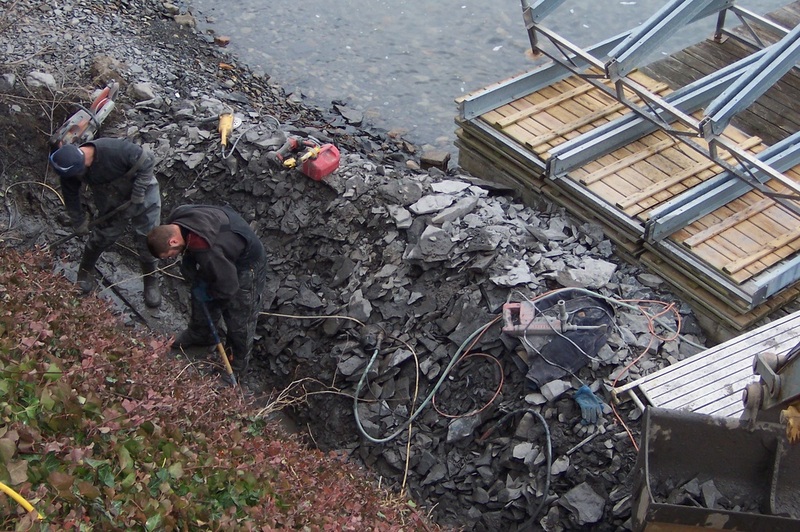 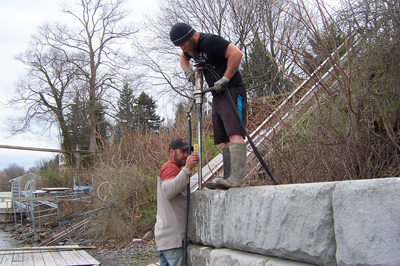 We are installing a Ready-Rock wall back from the shoreline, and improving some of the existing structures on the waterfront. 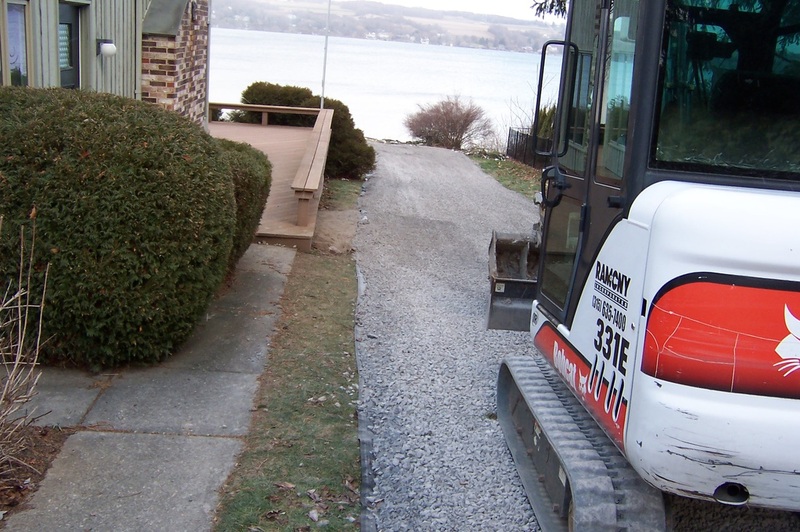 An access road was built to allow the movement of heavy equipment from the road to the worksite, which was below the lawn level. 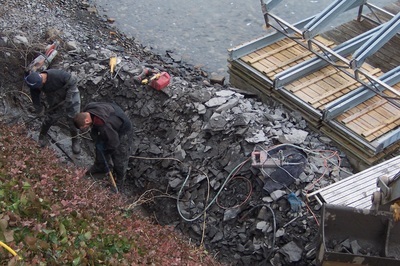 The shale base of the bank was excavated by hand back to bedrock to provide a flat stable surface for the block wall. 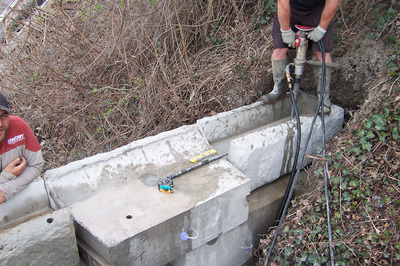 A concrete footer was constructed for the block wall in places where the bedrock was not flat and stable. 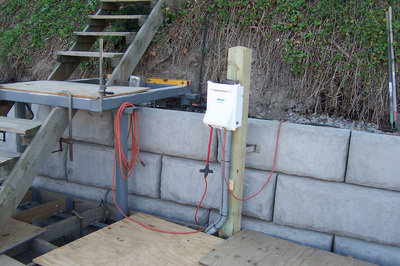 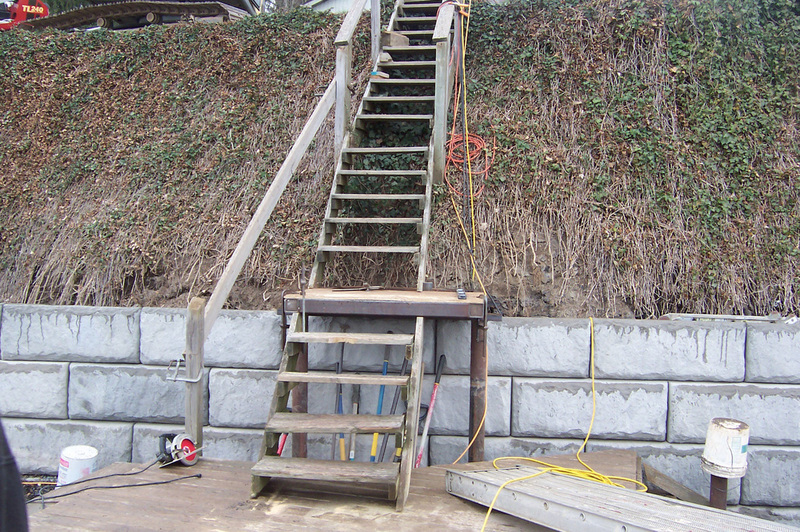 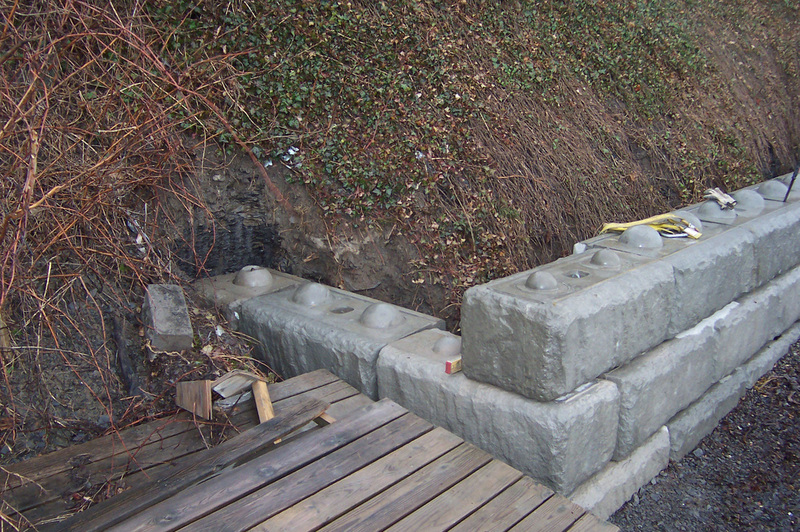 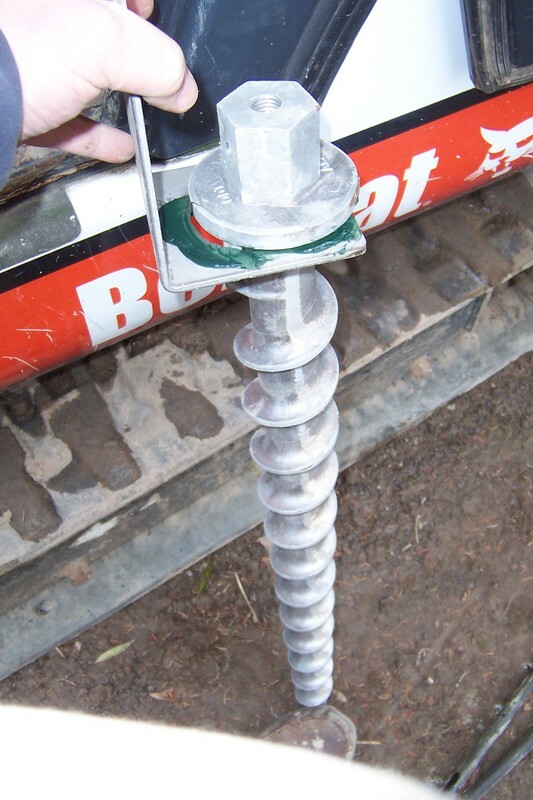 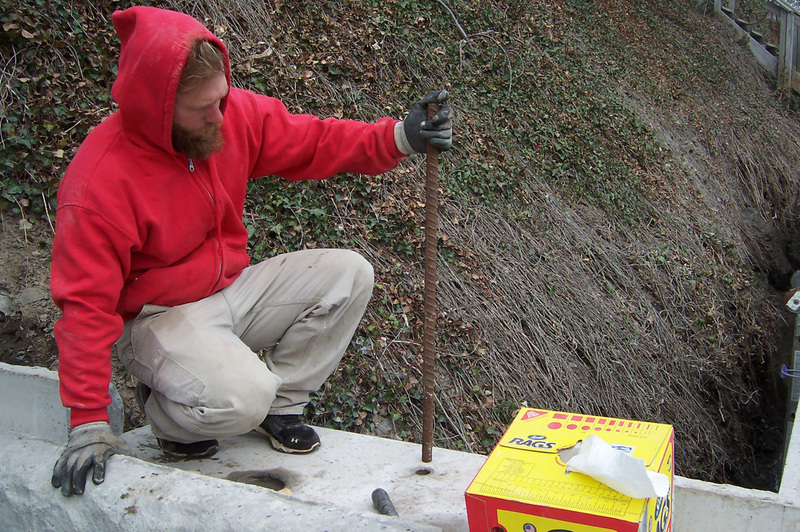 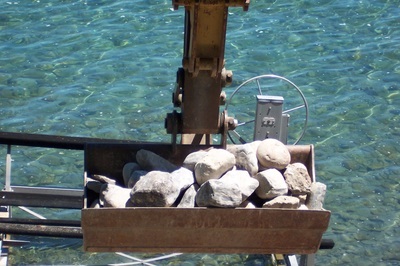 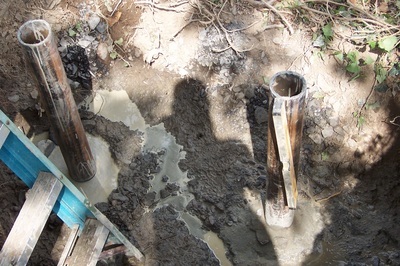 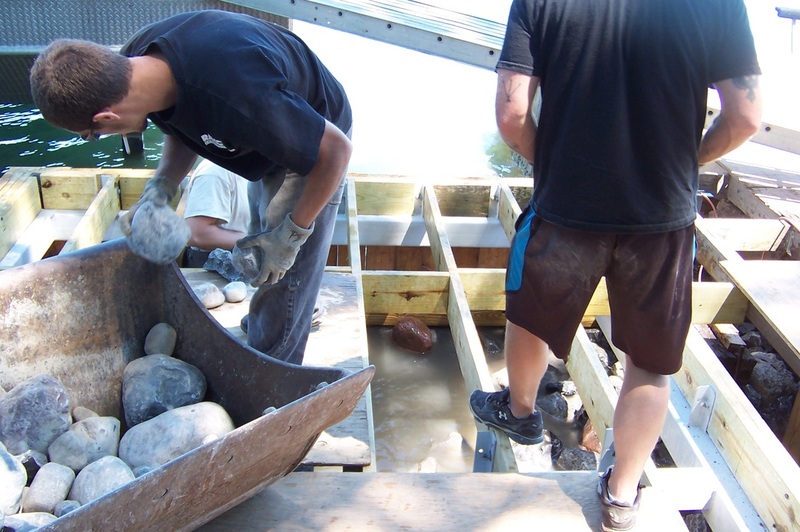 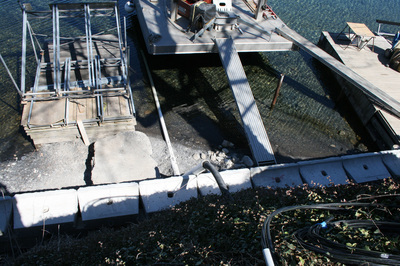 The bottom row of blocks was drilled and pinned to the bedrock or concrete with rebar and underwater grout. 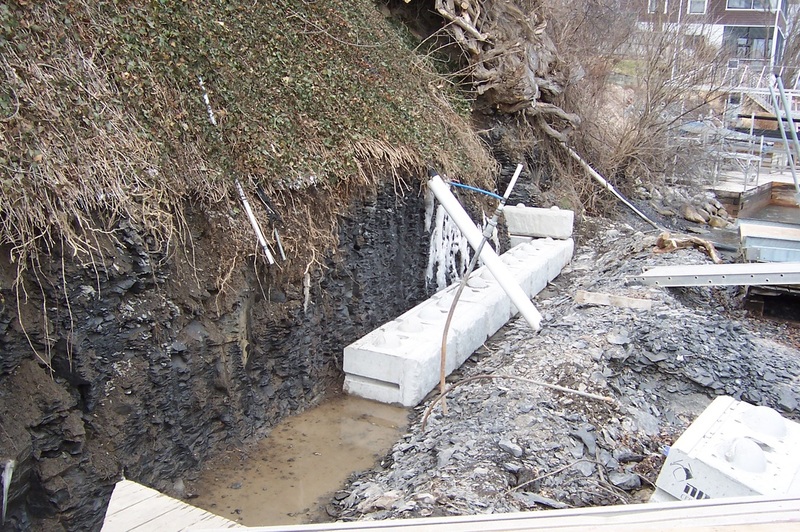 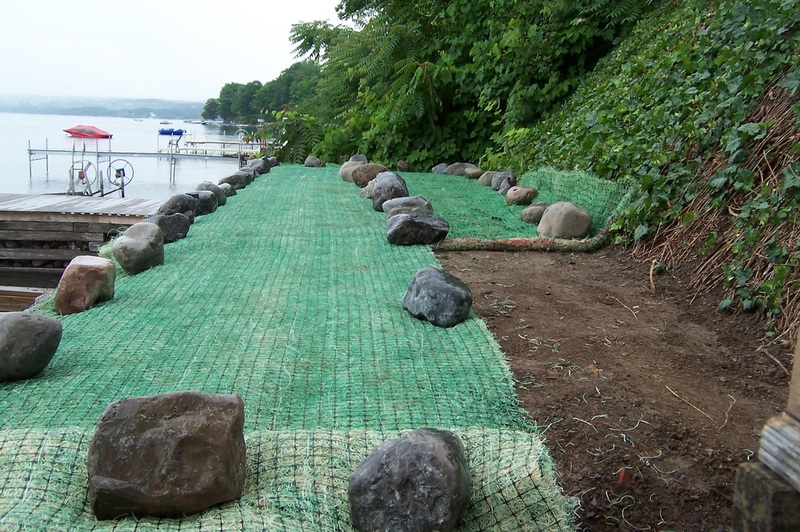 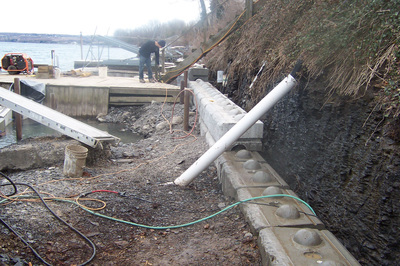 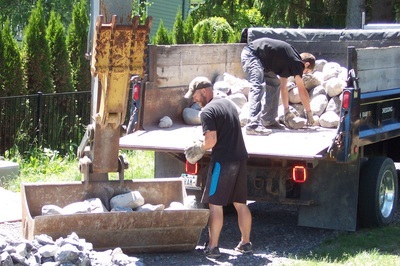 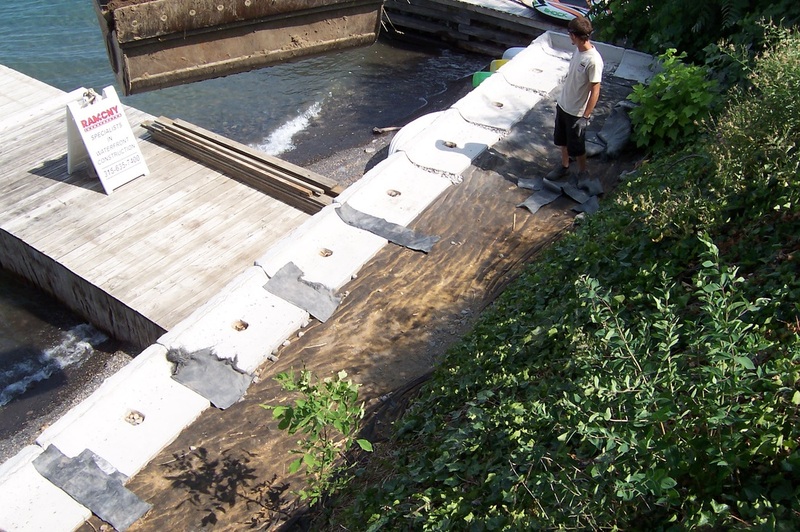 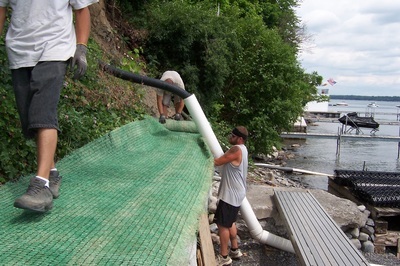 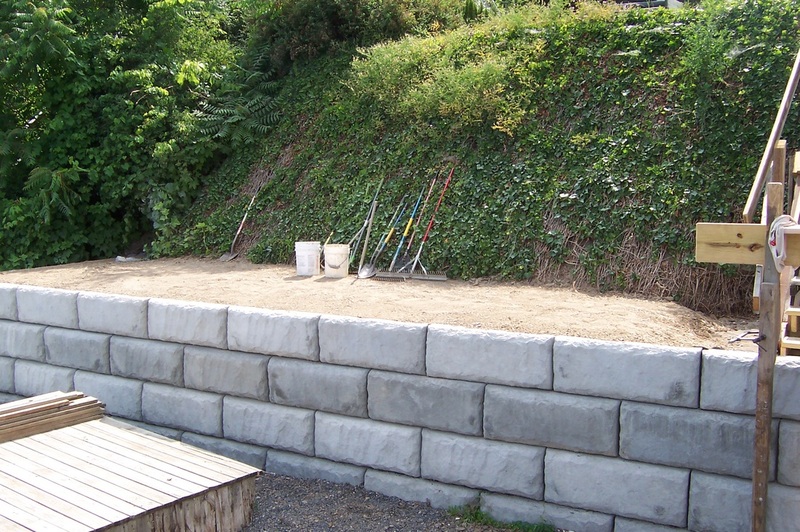 The completed wall is lined with Typar filter fabric and backfilled with stone. Electrical service has been brought down to the shoreline. 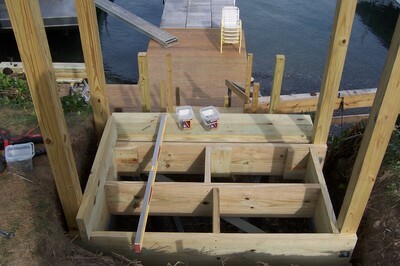 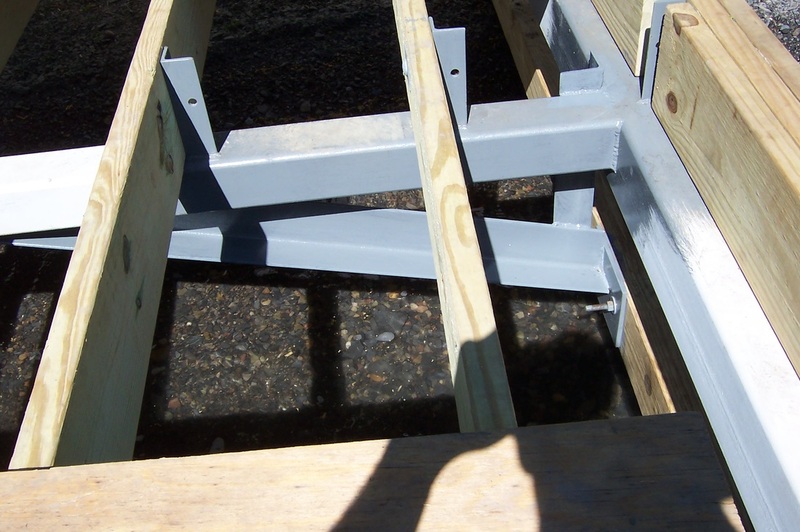 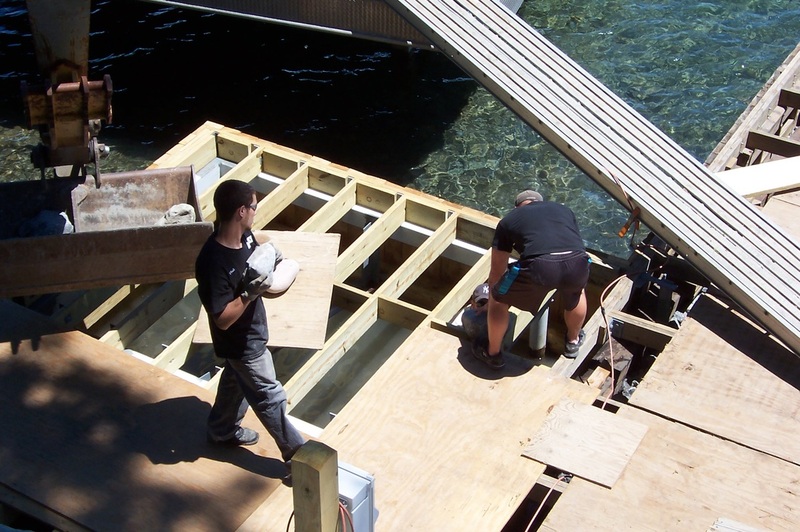 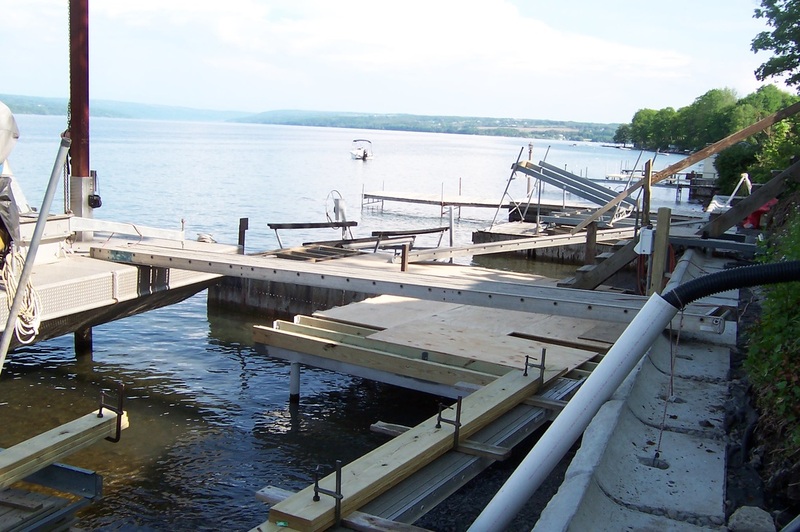 The old dock has received steel bracing and new joists . 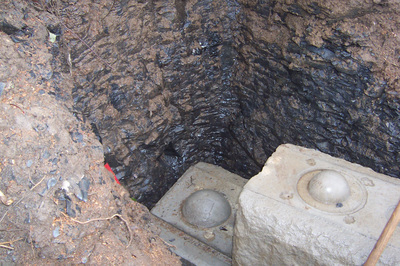 It has been filled with hand-placed stone. 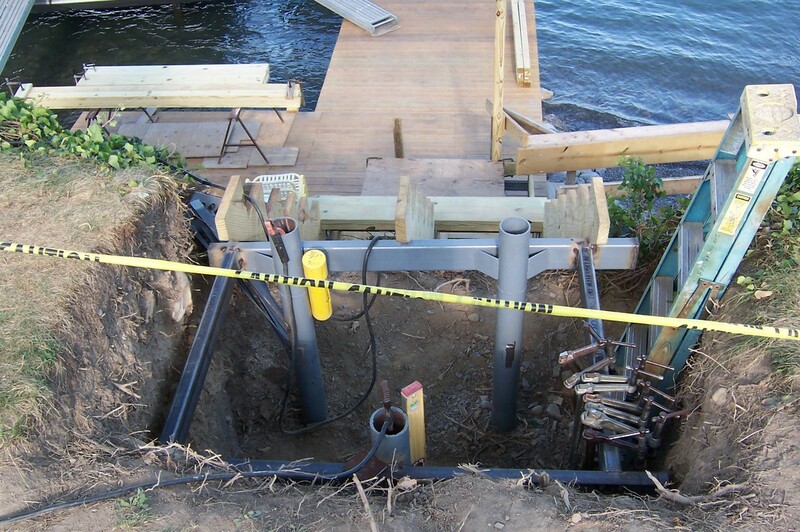 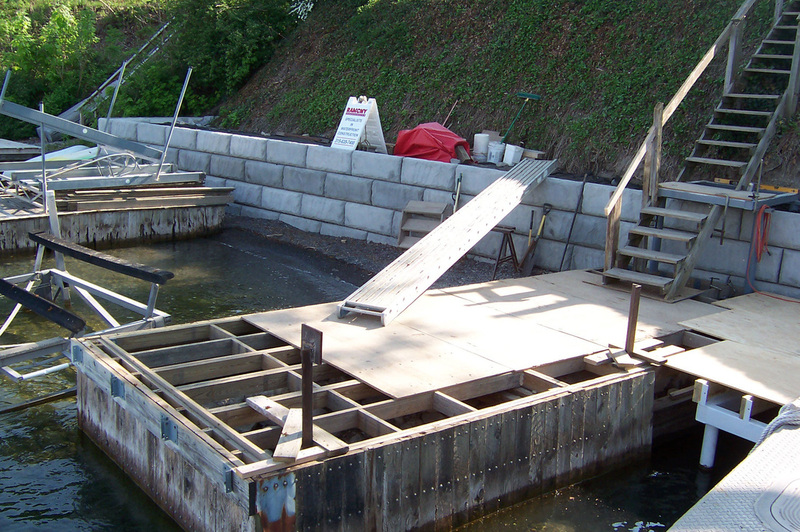 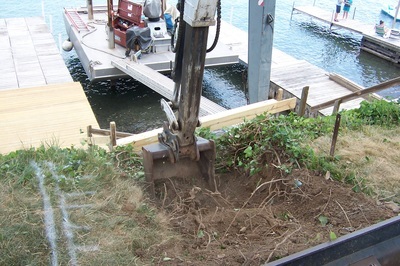 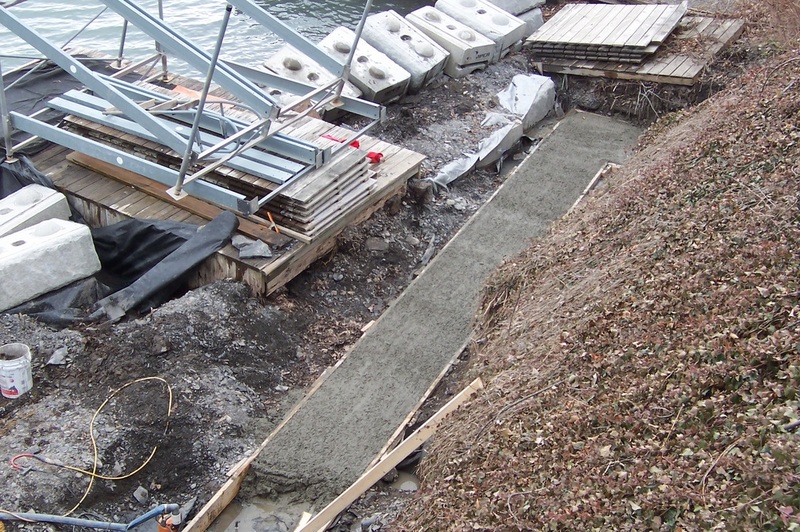 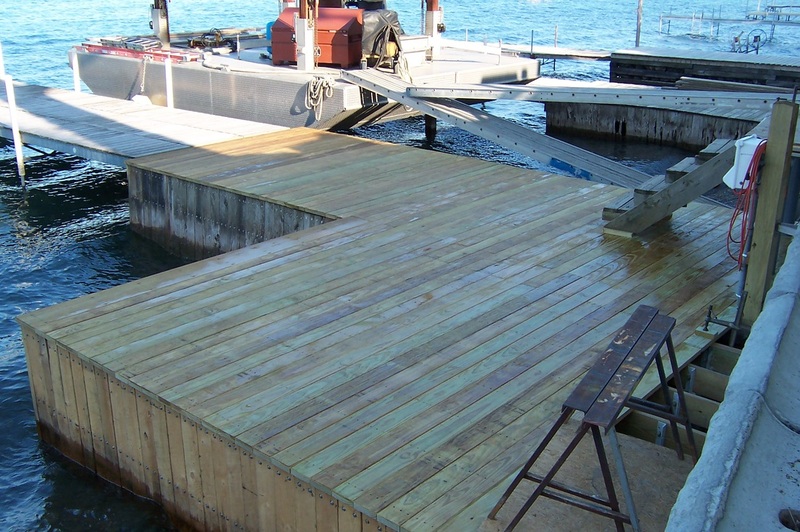 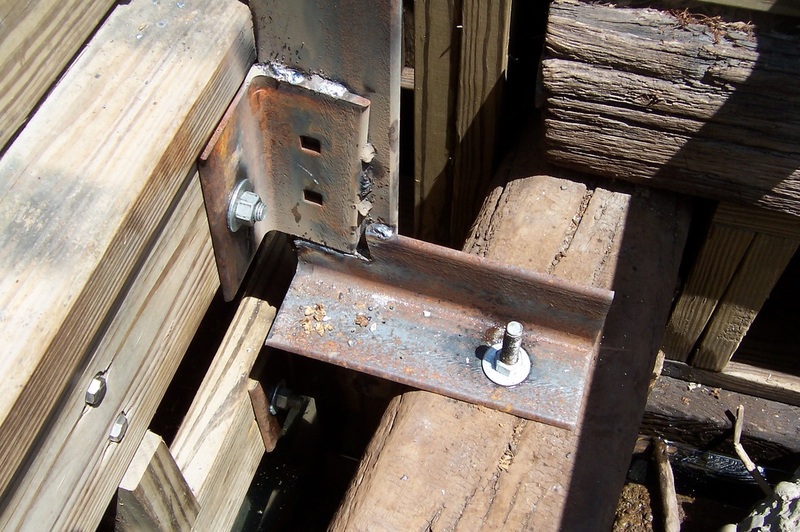 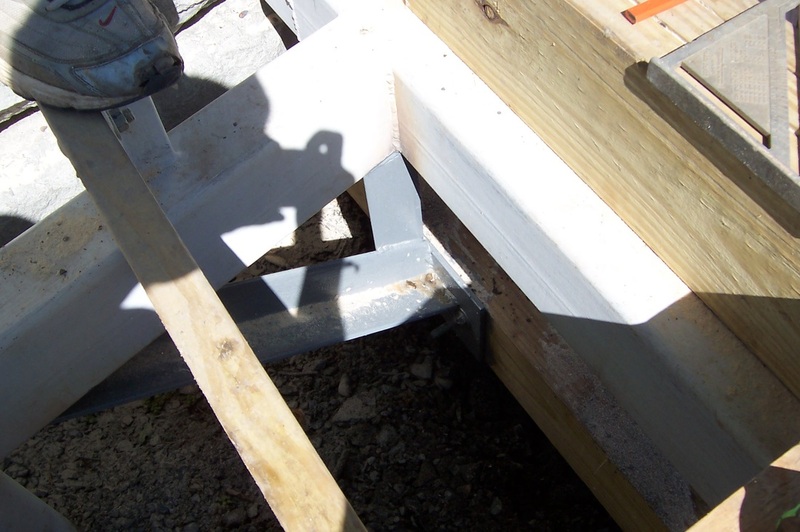 A new steel-framed section of dock, supported on steel pilings, has been added to the existing dock. 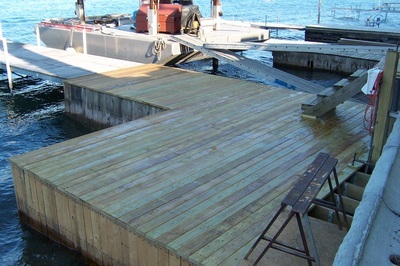 The decking is now complete. 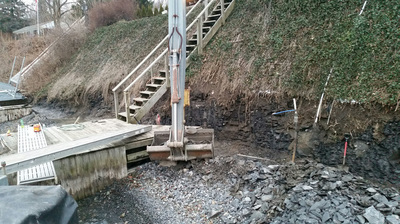 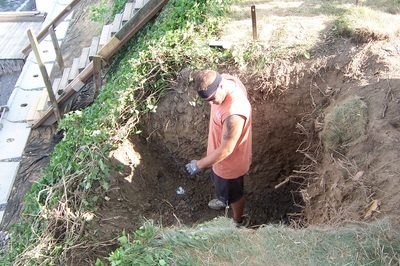 An area at the top of the bank has been excavated for the construction of the new stairs. 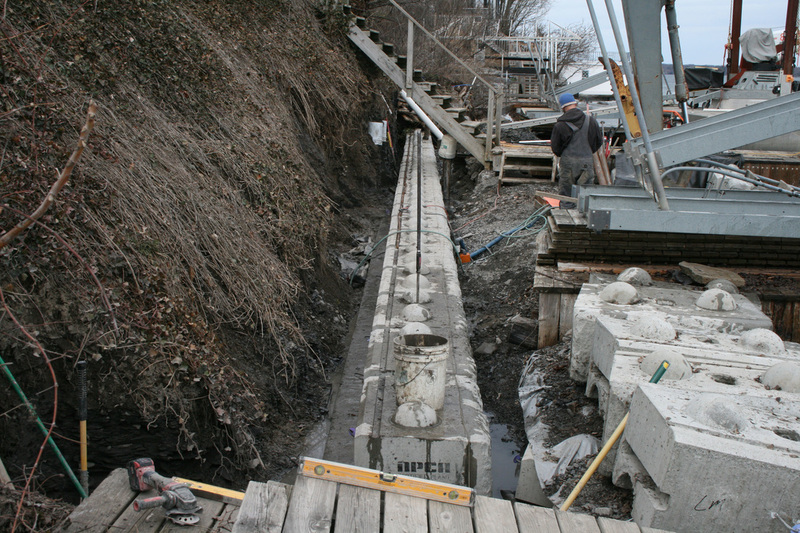 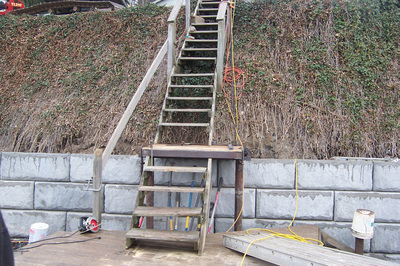 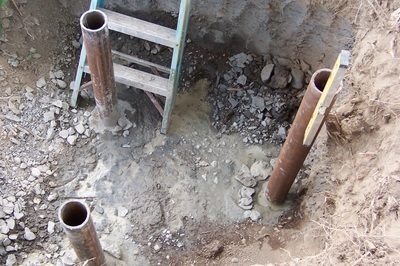 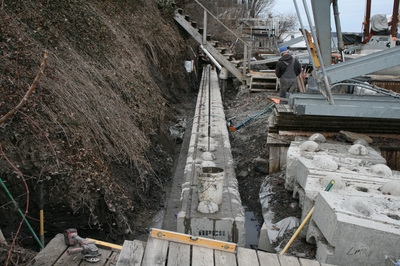 Four steel pilings have been core drilled into bedrock at the top of the bank to provide the support for the upper end of the new stairway. 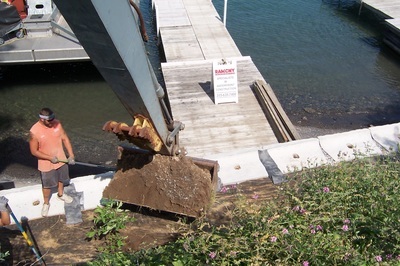 ...and topsoil is placed on it. 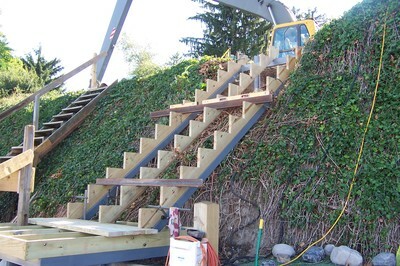 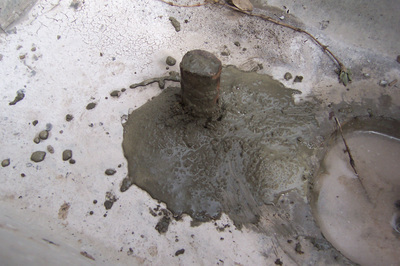 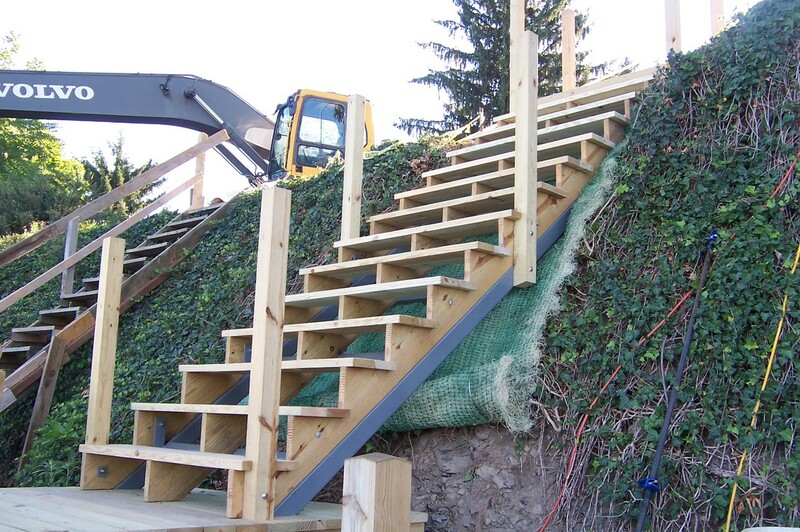 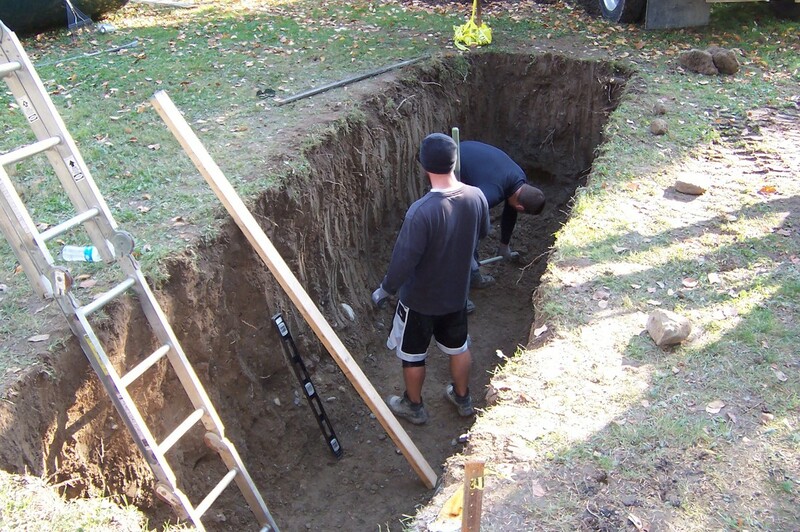 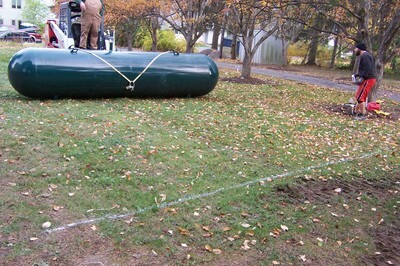 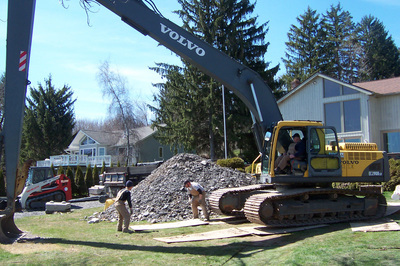 A foundation fabric is placed over the topsoil, and weighted with rocks. 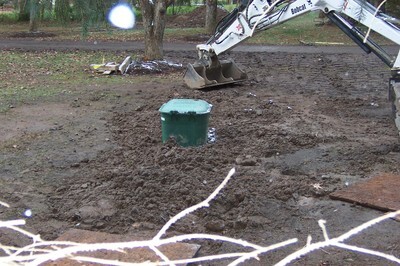 This will provide a base for grass seed. 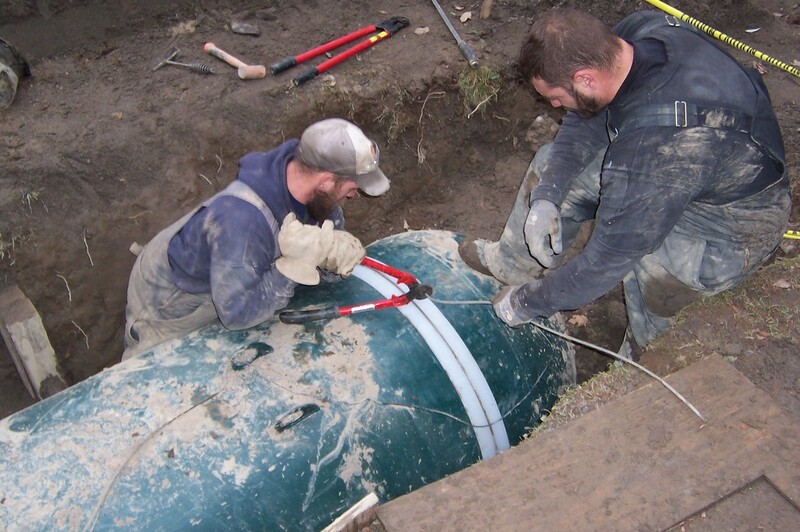 A new LP gas tank was installed.